One dark, rainy night, the boyfriend and I ventured to Paradise. Kabab Paradise, that is. Our elbows resting on the cool tabletop, we sat in a large, sparsely decorated room that was squirming with children and families. Intermittent baby cries could be heard, and a general hub-bub muffled our ears. People were walking about, and servers were bringing large trays of food to each of the tables, for which you were given a number after ordering at the counter. Your typical hole-in-the-wall, mom-and-pop quick food joint was my impression as we sat at the table, waiting for our platters to arrive. The boyfriend assured me that this place is much-beloved by his coworkers, who come often to gorge themselves on one of Paradise’s infamous platters. Our entrees arrived- both of us ordering the falafel gyro platter, heaped with rice, a carrot slaw, chunks of falafel, and amply doused in yogurt sauce. Okay, folks- getting a bit real here- even though this was tasty, it was very heavy, and a bit too greasy for me. However, 4.5 stars on Yelp as rated by 196 people really cannot lie. Call me an outlier; I digress. Anyway, due to this heaviness, I wanted a little something else that was a bit fresher. Kadoo Qorma, aptly described as “Pumpkin (Vegetarian Meal)”, piqued my interest. When do I not like pumpkin? Really never. And so it was ordered. 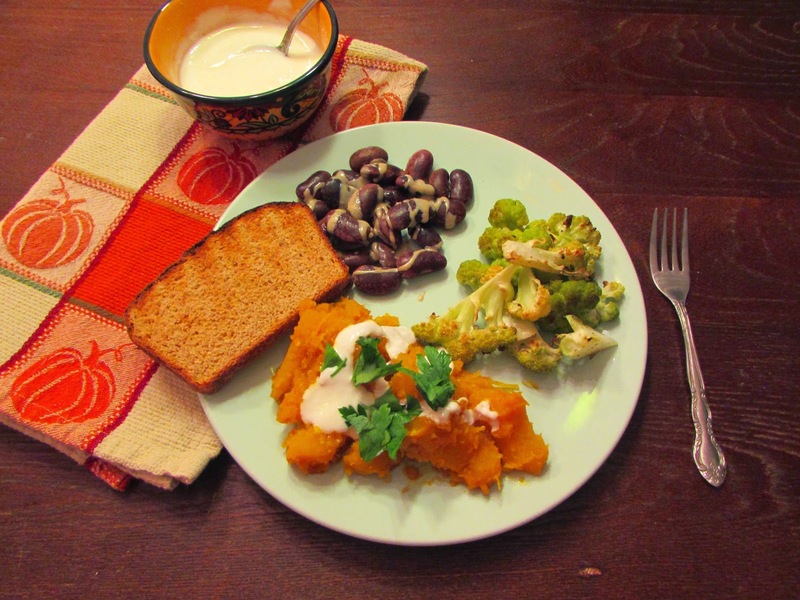 Upon arrival, it was not what I expected- more of a mash of pumpkin, served with warm Afghan bread, and drizzled with a stark white yogurt sauce. Pressing the warm bread into the garlicky, sweet pumpkin and the dabs of creamy yogurt made me close my eyes and sigh. The boyfriend’s eyes perked up, too. We were indeed in Paradise, and finished the entire plate despite having already eaten half of our platters. It was that damn good. It may be obvious to you by now that I clearly felt the need to replicate it in my own kitchen. After much diligent Googling, with “Kadoo Qorma” not resulting in much of anything, I discovered that the recipe is often called Borani Kadoo. With that stealthy information, I was able to scrounge up a couple of recipes, but they all seemed to be based off of one: Kate Sullivan Moford’s San Francisco Chronicle article, from 2008 (Come on people, was 2008 the hey-day of the Borani Kadoo recipe- at least for English-speakers? That’s 6 years ago. The web needs more Borani Kadoo recipes!). So, using Moford’s and Veggie Belly’s (who also uses Moford’s as inspiration), I created mine, eager to spread the Kadoo love. 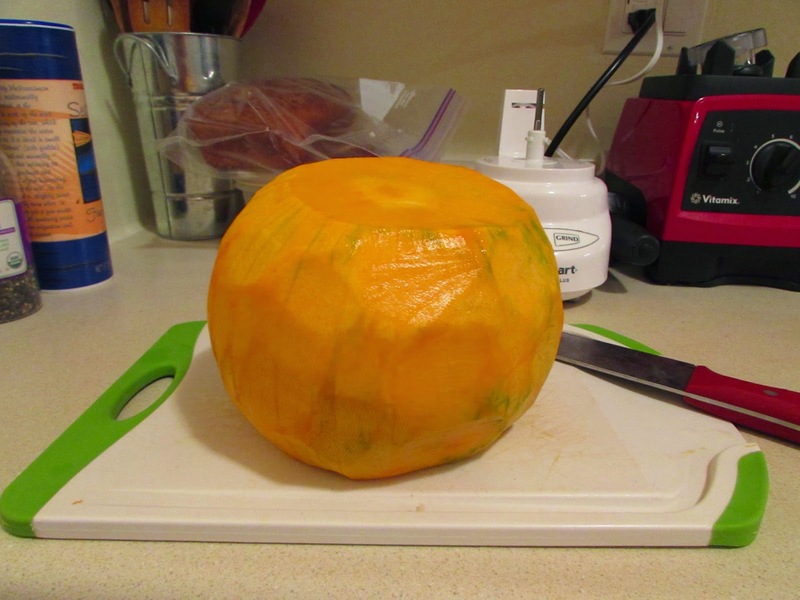 First, I peeled the pumpkin by shaving off the hard skin with a sharp knife. 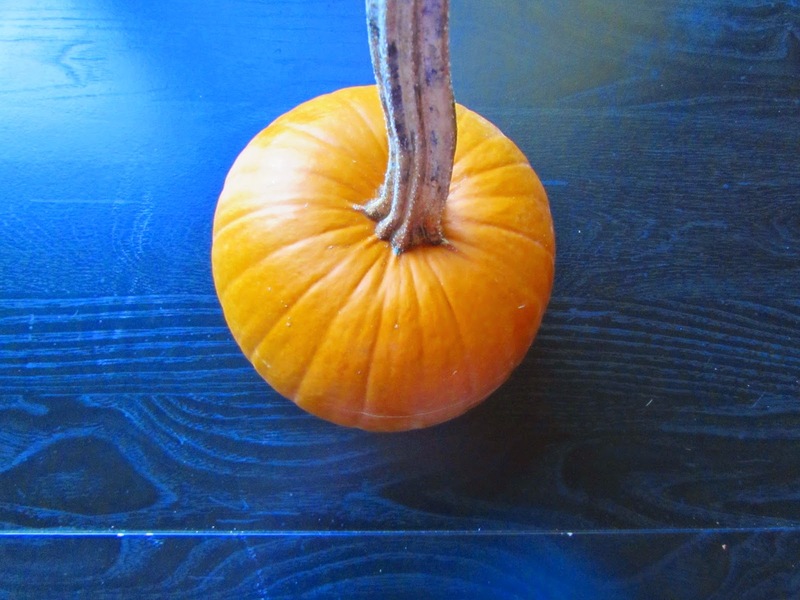 Ah, nakey pumpkin! Then I chopped it into chunks, mixed in garlic, ginger, and spices, and simmered it until soft. Borani Kadoo was born. I paired it with roasted green cauliflower, and scarlet runner beans drizzled in tahini (+ toast as pictured in first photo). A pumpkin-garlic mouth explosion. Heat oil in large skillet. Add pureed onion, and sautee for 10 minutes. Add the garlic, ginger, tumeric, coriander, and cayenne and cook for 2 minutes. Then add in the tomato paste, water, sugar, and salt. Bring to a boil. Add in the pumpkin, and reduce heat. 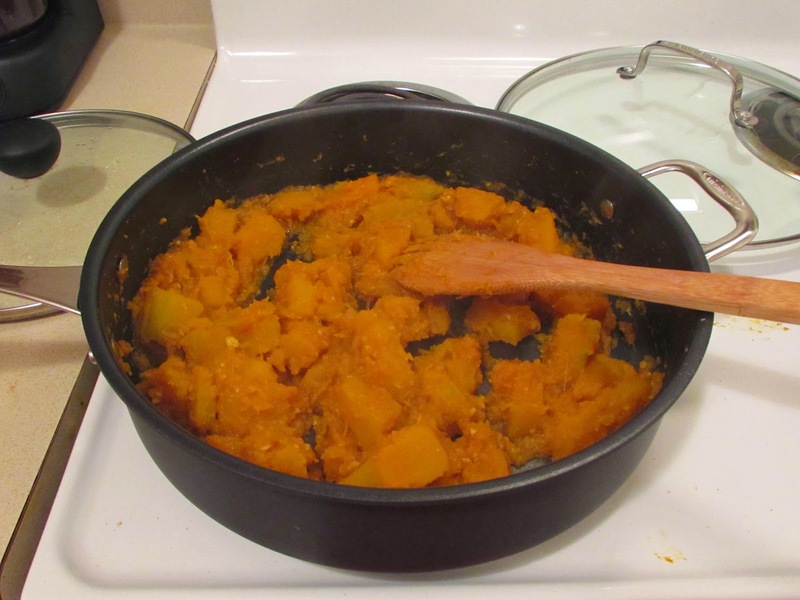 Simmer the pumpkin, covered, for 20 minutes, or until very tender. Add more water if needed when cooking. 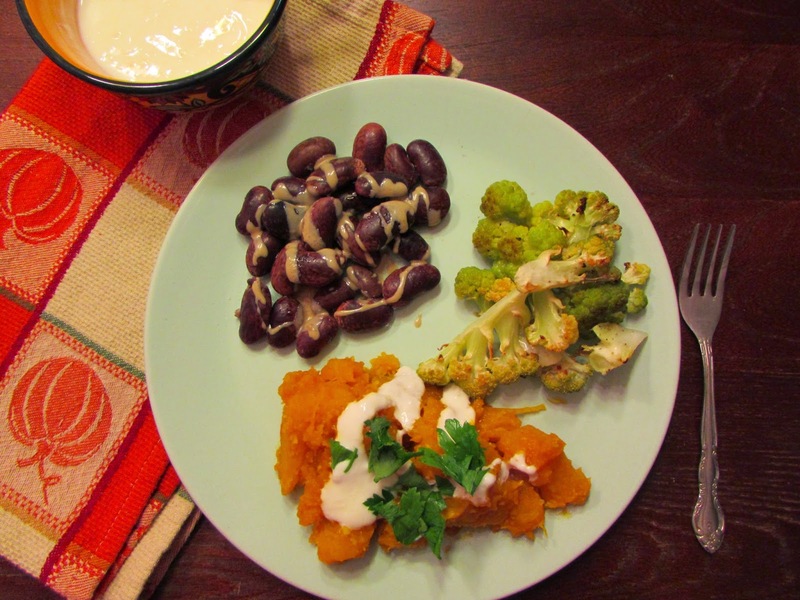 Drizzle with garlic yogurt sauce, as detailed below. Happy feasting! Combine 1 cup lowfat or full fat yogurt with 1 clove of minced garlic. Salt to taste. Drizzle over kadoo and enjoy.